Definition at line 34 of file CommandLine.h. A callback function for forEachOption(); receives parsed options. Must not call pushFrontOption(), hasOption() or forEachOption() – getopt(3) uses globals! Definition at line 52 of file CommandLine.h. Definition at line 24 of file CommandLine.cc. References argv_, assert, i, longOptions_, and xstrdup. Definition at line 46 of file CommandLine.cc. Definition at line 62 of file CommandLine.cc. References arg, argv_, shortOptions_, and xfree. 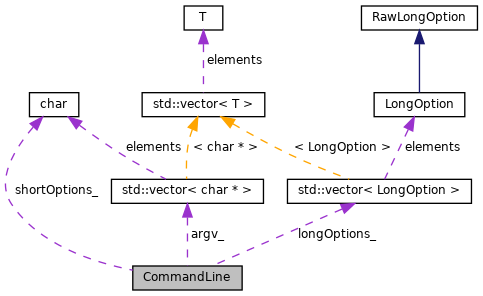 argv, which is usually a program "name"
Definition at line 58 of file CommandLine.h. Definition at line 61 of file CommandLine.h. Definition at line 64 of file CommandLine.h. Definition at line 89 of file CommandLine.cc. References nextOption(), optarg, and ResetGetopt(). whether the option with optId identifier is present When returning true, sets non-nil optValue to the found option's value. For letter options (-x) and their –long synonyms, the letter is the ID. For long-only –options, the ID is the configured options::val value. Definition at line 71 of file CommandLine.cc. Definition at line 73 of file CommandLine.h. Definition at line 101 of file CommandLine.cc. References argc(), argv(), argv_, assert, longOptions(), optind, SBuf::Printf(), shortOptions_, and TexcHere. Referenced by forEachOption(), and hasOption(). Definition at line 52 of file CommandLine.cc. References argv_, longOptions_, and shortOptions_. Definition at line 123 of file CommandLine.cc. References argv_, assert, and xstrdup. Definition at line 115 of file CommandLine.cc. References argv_, assert, xfree, and xstrdup. Definition at line 77 of file CommandLine.h. Referenced by CommandLine(), nextOption(), operator=(), pushFrontOption(), resetArg0(), and ~CommandLine(). Definition at line 81 of file CommandLine.h. Referenced by CommandLine(), and operator=(). Definition at line 80 of file CommandLine.h. Referenced by nextOption(), operator=(), and ~CommandLine().